Do you make donations to charity during the year? If so, it might be beneficial to claim these donations as a tax deduction. 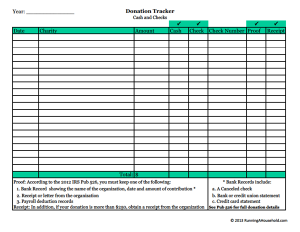 Whether you write a check or donate your used personal items, you’ll want a system to keep track of your donations. Please note: This information is not intended to serve as tax advice. It is just one method to track your donations. Please see your tax advisor or CPA for tax guidance. 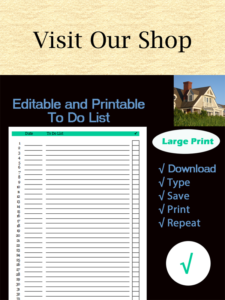 Taking a deduction requires some record-keeping. Don’t shy away because it takes work. Just be sure to follow the rules for documentation. Receipt: In addition, if your donation is more than $250, obtain a receipt from the organization. Did you do some spring cleaning recently? If you donated these items to a qualified charitable organization, you could be entitled to a deduction. Once again, record-keeping is essential, but not impossible. Not sure how to keep track of your donation? You’re not alone. There are a lot of rules and procedures. For our purposes, we will focus on tracking clothing and household donations. You know the ones: clothes your kids outgrew, the jeans that don’t fit you anymore, your husband’s size medium shirts. These items decreased in value since you bought them. We are also assuming each item is worth less than $250. Recordkeeping: If you make any non-cash contribution, you must get and keep a receipt from the charitable organization. However, you are not required to have a receipt where it is impractical to get one (for example, if you leave property at a charity’s unattended drop site). If you made non-cash contributions, you may be required to fill out parts of IRS Form 8283. 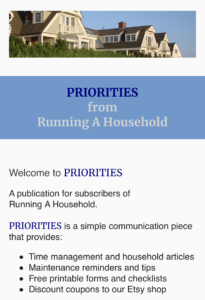 Want to keep your home running smoothly? 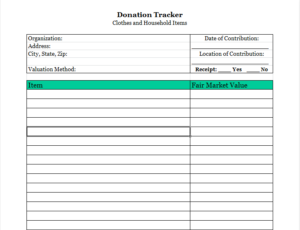 This entry was posted in Money and tagged chart donations, clothing donation value, fair market value donation, household donation value, how to track donations, track your donations, valuation guide donation on February 25, 2017 by Running A Household.